For the Kyanju "Friendship" competition. 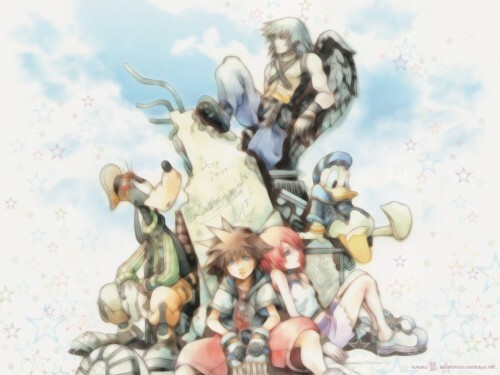 I really love KH, I loved this pic that Nomura-san did for the KH Remix "Deep Dive." I took the sketchy scan and worked with it to give it that luminous quality that shitajiki have when they're scanned in. I painted in the sky so it would fill up the space. The stars were brushed, then I did the cleaning technique of duplicating the layer, median below, low opacity on the layer above, so they would have the same quality as the scan. really pretty, i like how dreamy it looks. Riku is soo cute. ^^ It is like you said, "simple and clean". this wall really nice really suits the theme of "friendship"